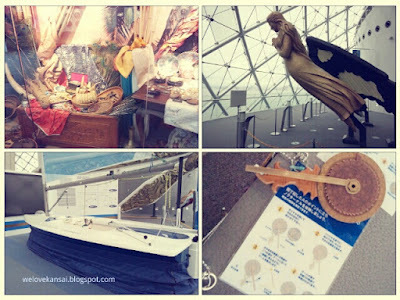 With all fervor surrounding the release of the newest PotC (totally going to see it when I get the time), why not make a post about Osaka's Maritime museum. Completely appropriateヽ(°▽、°）ノ. 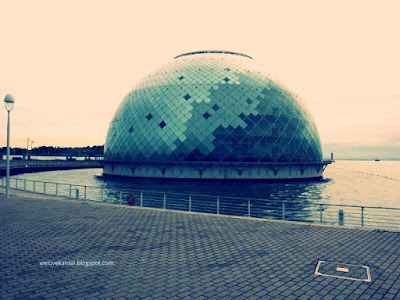 This photo was taken from the boardwalk leading toward to the museum from Cosmosquare Station. The walk from the station isn't so intense, just a few minutes, and you can get a nice look at other waterside sites from it. You can even see Universal City, which is where USJ (Universal Studios Japan) is located. 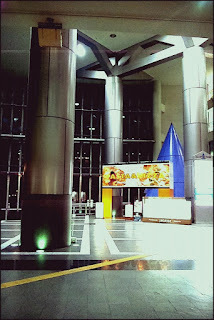 The closest station is Cosmosquare Station on the city subway, Chuo Subway Line or New Tram Nanko Port Town Line. Take Exit 1, and follow the boardwalk straight to the museum. The entrance fee is 600 yen for adults (high school students and older), 540 yen with a group of 20 or more, and free for children (junior high and younger). 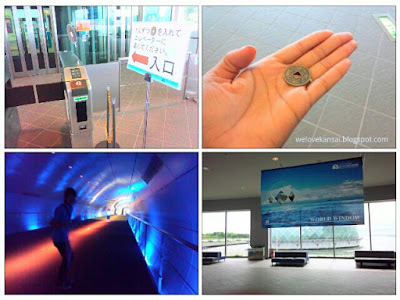 Starting from top left, going clockwise: 1. gate 2. coin for said gate 3. welcome banner 4. tunnel that leads to world's end. So you enter through the adjacent building, they give you a little coin (pic. above) which goes into the gate (also pic. above) which then leads you to an elevator you take downstairs, which then leads you to a tunnel that will take you to the world's end. Ah wait.. that's not right.. But you do get to encounter this bad boy once you step off the elevator. I do believe it's an art piece, quite fantastic. After gazing at this for a minute, you can then take the tunnel that'll lead you to world's end (sorry, I just finished watching PotC on TV (´＿｀｡)). Actually, the tunnel takes you right into the water. Well, that water is above you, so I guess you would be underwater, but only until you get to the museum. They've also put in these neat little holes in the ceiling so you can see whatever sea life happens to be passing overhead. I didn't see anything though(･_･). The escalator the takes you up to the museum comes up right under a huge Edo Period ship replica. 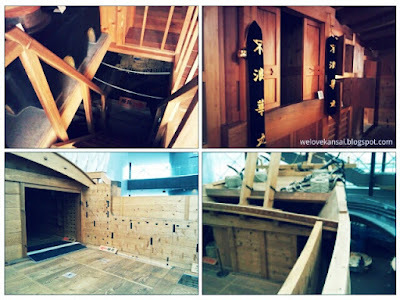 When you enter the museum, you're asked to take another elevator up to the top (4th) floor. From there you follow the exhibits back down to the first floor. 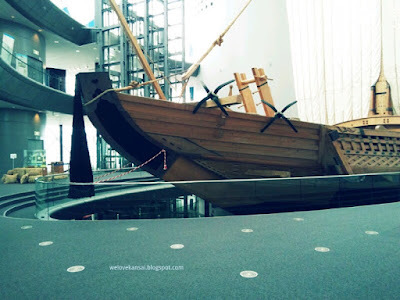 Seeing as it's a museum about ships, one of the first exhibits you encounter is about early ship work throughout the world, and devices used during those time and also the items traded. Examples of Chinese porcelain, fine textiles and spices (you can sniff all the spices if you like(ﾉﾟ∀ﾟ)ﾉ) as well as information on early explorers and traders, and the Age of Discovery (Magellen, Columbus, etc.). And there was this small boat (pictured bottom left) that was available for some virtual sailing game, but it had already ended by the time we'd gotten there. Dang(´д｀) Always wanted to try sailing.. The bottom photo is a set up used for presentations from museum staff... maybe.. I didn't read that description either, but there were benches laid out in front of the booth like a small theatre. I wonder what kind the play was of（´∀｀）. I think the main attraction of this museum are the collection of actual boats housed inside. 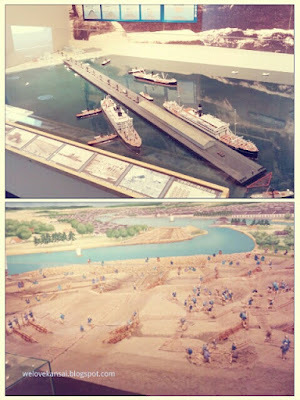 The boat pictured on the top right is an early (maybe Jomon? 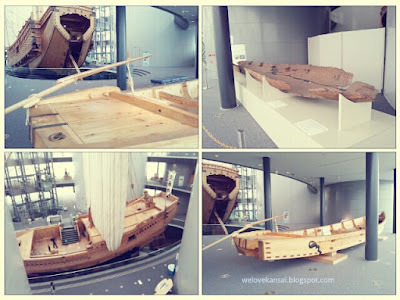 the website says it was used 5000 years ago) Japanese boat made from a single tree trunk called a kurifune. 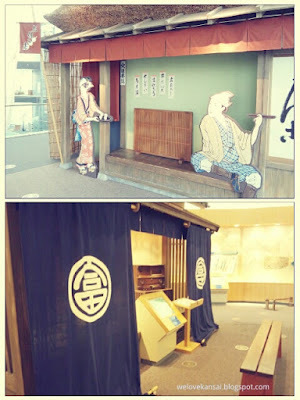 The other two are from the Edo period, the larger one being a life-size replica of Naniwamaru, a trading ship. They actually sailed it from Osaka to South Korea a few years back (like 1989 or so). The smaller one is just a junk boat(;´▽`)y-~~. 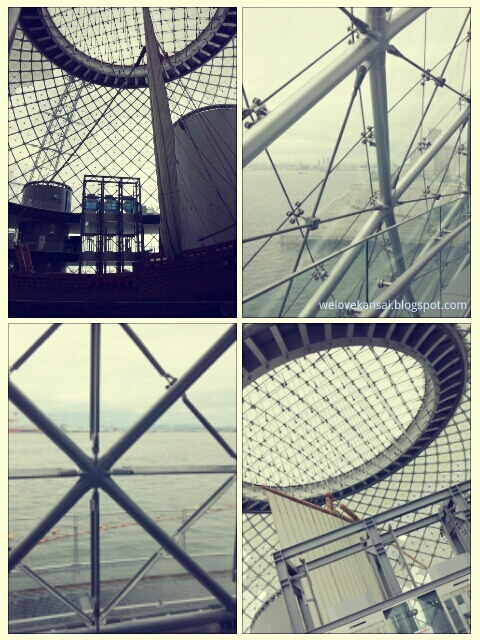 I thought it was really interesting that the ship included a space for a Buddhist prayer alter (top right). 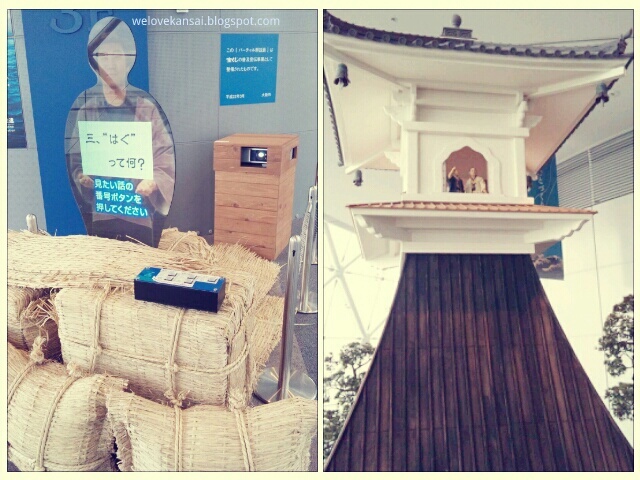 Overall, I thought it was a nice museum. It was my first maritime one, so it was nice to get a glimpse at the history of maritime travel, especially in reference to Osaka. 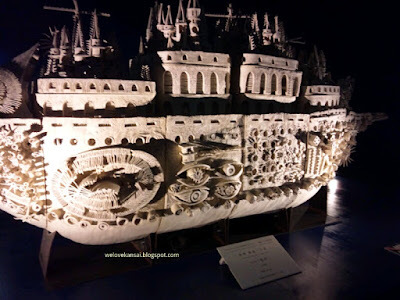 It was still a bit tough for me to part with 600 yen (all the museums in D.C. are free... freeeeeヽ( ;´Д｀)ノ), and I can't say it'd go again, but if you like boats, why not?? I think it's pretty nice way to spend a morning or early afternoon in the harbour. If you don't like boats, well then there's always USJ or Nanba for you（●´－｀●）. I was going to do a seperate post about Cosmosquare, but quite honestly there wasn't much going on there. This map sure makes it look busy though! Zepp Osaka is located here, so that's an important thing to note, especially if you like concerts. But after that, there really is only the maritime museum and Zepp. 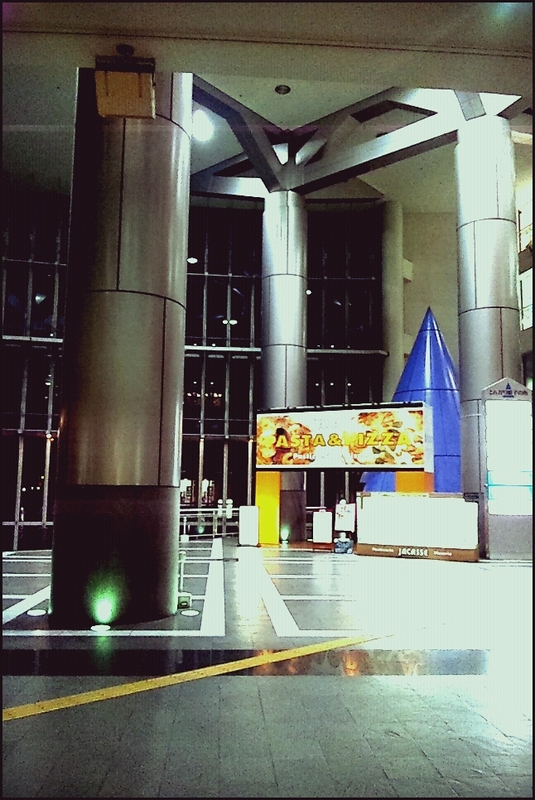 The International Ferry Terminal is located here, where you can take a ship to South Korea or China, and then there's there ATC (Art and Trade Center), but that was such a sad little venue. 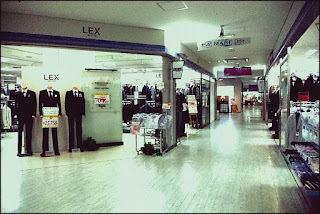 A ragged collection of off-brand clothing shops, jewelry, cosplay (yea, that surprised me too（´°∀°`）) and restaurants. It was almost completely completely filled with 20 students on a school trip (it seemed) and a couple people and some businessmen waiting to catch the ferry. Here's a photo of the Osaka Bay as seen from Cosmosquare. There's USJ.. somewhere... off in the distance. Here's an interior shot I took of ATC. Does it look haunted to you, because this part of the center totally creeped me out. 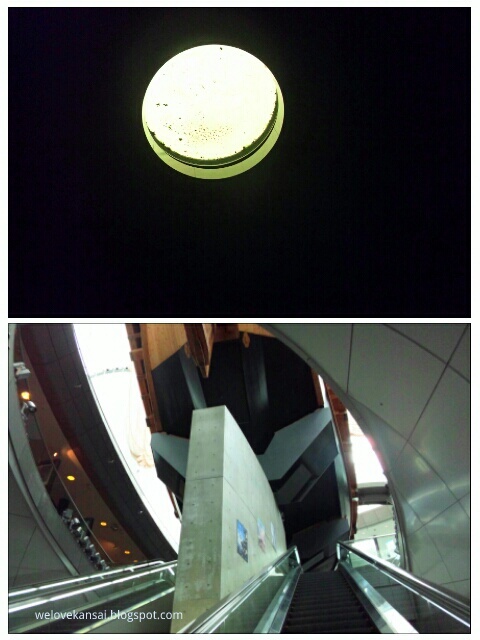 It's so dark it looks closed but it was supposed to be open（・Ａ・）! Anyway, that's all for now! I didn't spend the last weekend in Osaka *le gasp* so I don't have anything new to write about, but I might finally have a night life post up this month! People are forcing me out to mingleヽ(´Ａ｀)ノ I'll be updating my Kansai★ガール blog (really the original incarnation of this blog) in the mean time with some photos from Disneyland and Disney Sea!